SCOTTISH netball stars are going for gold in the Commonwealth Games cheered on by one of their bravest fans. Nine-year-old Amy Reid who lost a kidney to cancer was treated to a VIP tour of the Emirates Arena Stadium in Glasgow by the Scottish Thistles national netball team. The players who will begin the 10,000 mile trip to Australia on Friday (March 23) to compete at Gold Coast 2018 gave Amy a signed netball, tshirt, pen and free tickets to an upcoming UWS Sirens game (Scotland’s semi-pro franchise for whom most of the Thistles play) where she has also been invited to be the Captain’s mascot on their return from the Commonwealth Games. The visit was organised to boost awareness of Cancer Research UK’s Race for Life events this spring which raise millions of pounds to fund crucial research. Every hour, four people are diagnosed with cancer in Scotland*. 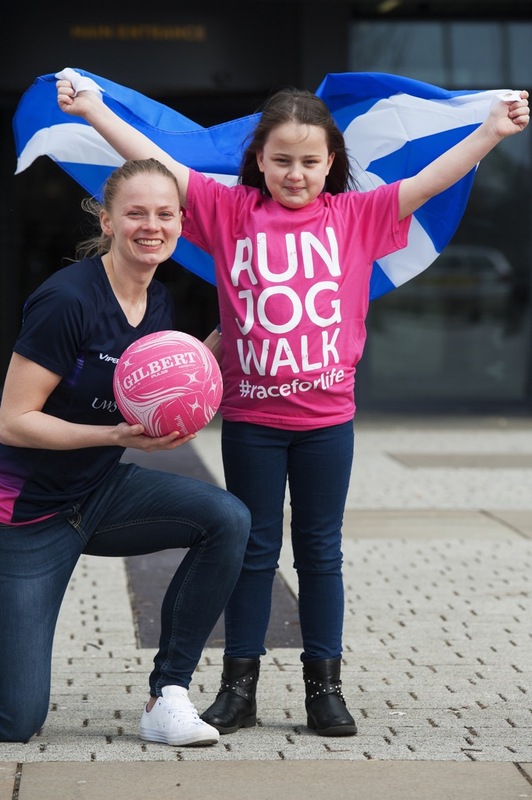 Now, to help beat cancer sooner, members of Netball Scotland have pledged to pull on their trainers and take part in Race for Life Glasgow on May 20 at Glasgow Green and are urging other women and girls across Scotland to sign up too. Amy who is 4ft 7in chatted to netball stars including the tallest member of the Scottish Thistles, goalkeeper Ella Gibbons, 23, who is 6ft 3in, as well as team captain, Claire Brownie. In February they were part of the team which saw Scotland qualify for the 2019 World Cup. At the Commonweatlh Games on the Gold Coast which starts on April 4, they are in pool B so will take on 2014 silver medallists New Zealand. They’ll also play England, Wales, Malawi and Uganda. Claire, 29, said: “We were all moved and inspired by Amy’s courage and bravery. Amy of Coatbridge, North Lanarkshire, who endured a life saving stem cell transplant knows exactly how tough it can be going through cancer. Her family have raised vital funds for Cancer Research UK by taking part in the 5K at Race for Life Glasgow every year since Amy was diagnosed with the disease in September 2012. This year, as Amy takes her place on the start line along with her mum Laura, 39, and sister Sophie, two, she’ll also be cheered on by her dad Robert, 41, and brother, Gary, 19. Amy’s proud mum, Laura said: “Amy really is our superhero. “Amy has kept us strong through it all. At the time we couldn’t see a light at the end of the tunnel. We thought Amy was never going to get through this. It was frightening. Now looking at her, I can’t believe she was ever so ill. Her recovery has been amazing. “Amy did her first Race for Life 5K event while still going through treatment for cancer and it’s been a really important part of our lives ever since. If Amy’s story can help other families going through cancer right now then we’ll have made a difference. Amy was only three when she first became ill with a high temperature just hours after her mum and dad’s wedding day on September 21 2012. The family were set to jet off on holiday to Spain after the marriage at St James Chapel, Coatbridge. Instead they ended up at Wishaw General Hospital and then Yorkhill Children’s Hospital after Amy’s condition deteriorated. Scans showed a tumour on Amy’s left kidney was stopping it from working properly. Amy was diagnosed with a Wilms tumour and endured a six hour operation to remove the kidney. Amy’s mum, Laura said: “As I took Amy down to the operating theatre I was trying to stop myself crying to keep Amy calm so she would be okay. Amy started on chemotherapy but it was a hammerblow when tests revealed there was also a tumour on her lung. It meant a second operation to remove the tumour followed by a year of chemotherapy and radiotherapy. Amy lost her hair and became a regular at the Schiehallion ward at Yorkhill. By October 2013, doctors explained that Amy’s best chance of survival was a stem cell transplant, to help her body make new healthy blood cells after her own had been destroyed by the disease. It meant two weeks in an isolation ward to reduce the risk of infection. By Christmas that year the family got the best present of all when doctors explained the cancer had gone. Amy who is now a primary five pupil at St Timothy’s Primary school in Coatbridge is loving life. Cancer Research UK Race for Life organisers are appealing for women and girls to stride out to beat cancer sooner this spring with Scotland’s first Race for Life 5K of the year kicking off in Stirling and South Queensferry on May 13, closely followed by 5K, 10K and Pretty Muddy 5K events across the country, everywhere from Glasgow to Aberdeen, Fife to Falkirk, Dundee to Irvine. Cancer Research UK’s Race for Life, in partnership with Tesco, is an inspiring women-only series of 5k, 10k, Pretty Muddy, half marathon and hiking events which raise millions of pounds every year to help beat cancer sooner by funding crucial research. “By signing up to Race for Life, women across Scotland can make a real difference in the fight against cancer. Money raised will help Cancer Research UK scientists and doctors find new ways to prevent, diagnose and treat the disease, helping save more lives. “Race for Life is a hugely moving experience – full of emotion, courage, tears and laughter – as people come together to remember loved ones lost to cancer, celebrate the lives of those dear to them who have survived or support those going through treatment. By joining like-minded ladies committed to the cause, women can unite against a disease that affects us all in some way. “Every day, 87 people are diagnosed with cancer in Scotland. That’s why we need women across Scotland to sign up to Race for Life this January and join mothers, daughters, sisters and friends at the start line when events kick off this summer. Cancer Research UK’s life-saving work relies on the public’s support. Thanks to the generosity of its supporters, the charity was able to spend more than £34 million last year in Scotland on some of the UK’s leading scientific and clinical research – helping more men, women and children survive the disease.